As North Carolina chafed at British rule and edged toward independence during 1774 and 1775, the former colony was governed largely by a new Provincial Congress and, at the county level, by local Committees of Safety. News of resistance in other colonies was spread by local Committees of Correspondence. As events unfolded, several local committees published documents, known as "resolves" or "associations," that stated the position of the delegates on loyalty to the Crown and to the emerging American republic. The early resolves usually carefully pointed out that the rebellious colonists were actually loyal to the Crown but objected to certain policies of Parliament that they believed to be unfair. Gradually, the professed loyalty to the Crown became conditional upon the colonies receiving fair treatment and justice from the king. From that point, without meaningful overtures from the Crown, it was a short step to calls for complete independence. An early series of resolves in North Carolina date from the summer of 1774, when county Committees of Safety were selecting delegates to the First Provincial Congress, held in New Bern from 25-27 August. 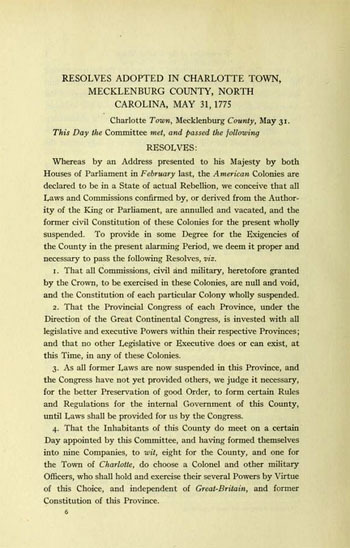 The North Carolina resolves of 1774 affirmed loyalty to the Crown while also declaring that the colonists could not be taxed without their consent or the consent of their elected representatives. Most of these documents specified that the colonial Assembly, not Parliament, had the right to tax them, that the colonists should have the same rights as British citizens, that recent Parliamentary acts to punish Boston for radical activities were cruel and unlawful, that the colonies should unite to resist unfair British policies, and that a boycott of British goods by the colonies should be imposed if Parliament did not institute more favorable policies. Each set of the surviving 1774 county resolves also named delegates to the upcoming Provincial Congress. The resolutions passed by the First Provincial Congress closely echoed the resolves enacted by the counties. Another series of resolves, more emphatic and advocating complete independence from Great Britain, was passed after the 19 Apr. 1775 Battles of Lexington and Concord, in Massachusetts, which marked the beginning of armed conflict with Britain. On 31 May the New Bern Committee of Safety passed a strongly worded set of resolves calling for support for the armed struggle against England, because the "British Ministry mean no longer to receive the peaceable addresses of the much injured People of America." Also on 31 May 1775, the Mecklenburg County Committee of Safety met in Charlotte and passed the Mecklenburg Resolves. Far more radical than the New Bern document, the Mecklenburg Resolves denied the authority of Parliament and specifically rejected the authority of the king-the first time any colonial committee had done so. The document declared all laws passed under royal authority to be void, condemned all holders of royal commissions as enemies, and called for a temporary local government to run affairs until a Provincial Congress could meet and pass new laws. Following the Mecklenburg Resolves, the New Hanover County Committee of Safety drew up an "association" that was "unanimously agreed to, by the inhabitants" on 19 June 1775. Although holding out hope for "a reconciliation" with Britain, the New Hanover committee stated that "under our present circumstances, we shall be justified . . . in resisting force by force." In Cumberland County, 54 men signed a similar document at Liberty Point on 30 June 1775, using wording much like that of the New Hanover Association. On 1 July 1775 the Pitt County Committee of Safety produced a set of resolves at Martinborough. This committee still professed loyalty to the Crown but pledged to follow the directives of the Continental Congress to resist "the several arbitrary Illegale acts of Parliament." The Tryon Resolves were passed by the short-lived Tryon County's Committee of Safety on 14 August. All of the resolves penned in 1775 declared that British provocation had driven the people of North Carolina to armed resistance, that they should unite in resistance with the other colonies, and that they would follow the directives of the Provincial and Continental Congresses. The Halifax Resolves, signed on 12 Apr. 1776 by the delegates of the Fourth Provincial Congress, ended the series of resolves with a bold call for independence not only for North Carolina but also for all of the American colonies. The dates of the Halifax Resolves and the 20 May 1775 Mecklenburg Declaration of Independence (a legendary document that is most likely a distorted echo of the Mecklenburg Resolves) are inscribed on the state flag of North Carolina. Robert L. Ganyard, The Emergence of North Carolina's Revolutionary State Government (1978). Transcription of the Mecklenburg Resolves: "Resolves Adopted in Charlotte Town, Mecklenburg County, North Caroina, May 31, 1775." Library of Congress, Legislative Reference Service; Tansill, Charles Callan. Documents Illustrative of the Formation of the Union of the American States. Washington: Government Printing Office, 1927. https://archive.org/stream/documentsillustr00libr#page/6/mode/2up/search/mecklenburg (accessed June 1, 2015). 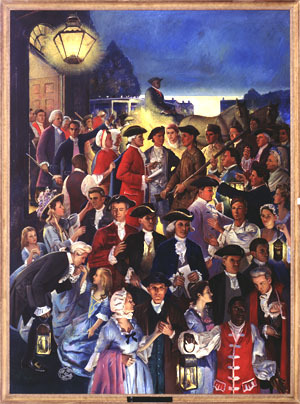 "Halifax Resolves This mural depicts the delegates to the Fourth Provincial Congress at Halifax leaving the meeting house at nightfall on April 12, 1776, after they had voted "to concur in independency" by adopting the Halifax Resolves. Among those in the scene are Samuel Johnson, Thomas Burke, and Cornelius Harnett. This mural was painted in Williamsburg, Virginia, where Paul Green's drama "The Common Glory" was playing at the time, enabling Kughler to use the costumes and actors as models." Photo and caption courtesy of the UNC School of Government. Available from http://www.iog.unc.edu/75/murals.htm (accessed May 11, 2012). Trying to validate that my 5th GGFather George Black was the George Black signer of the Tryon Resolve. He had sons Hugh, James, Joseph and Patrick who all appear in the first court records in Kentucky 1783.